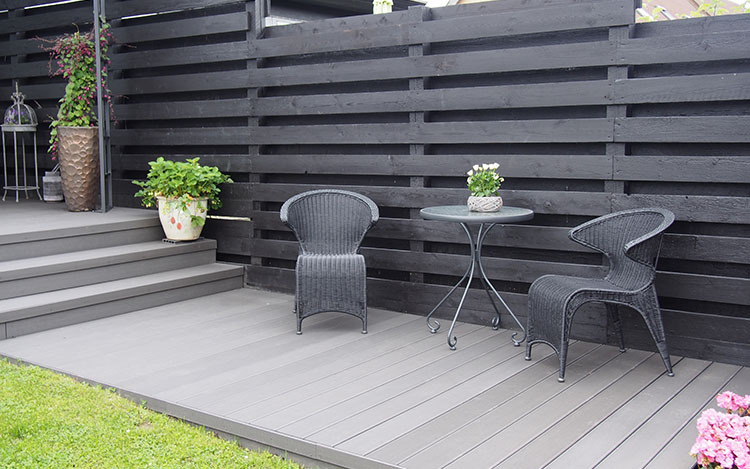 How to Decorate WPC Decking? Upon completion of the WPC decking, firstly, we should consider what kind of outdoor furniture and how to place them. For example, place a sofa and a small coffee table to enjoy the leisure time, or set tables and chairs to create an outdoor restaurant, you can also choose to put a cane chair and a casual sunshade, or build a pergola to take a nap and read in the sun. Choose a theme that suits you, with different furniture collection, easy to turn a dull deck into a charming and comfortable outdoor space! You can use outdoor WPC planter pots to decorate your deck, just put them on the deck directly without digging, adding gorgeous color and flower scents. You can also buy several WPC planter pots to outline your patio. If you have a large courtyard, plant some small trees and rose bushes in the WPC planters to create a small garden. In addition, use different size of WPC planters in different places, combine your own idea to create your own outdoor space. Finally, lighting is often overlooked as an outdoor design element, and lighting has a significant impact on the atmosphere of the deck area. A single light source is not enough for a night party on your deck, perfect lights are very important. We also supply the fashion outdoor lights to match our WPC products. How to Build a Pool Decking?